The Art Museum at the University of Virginia now has up a show of 35 photographs called Southern Views/Southern Photographers, intended to bring together some of the Museum's recent acquisitions of photographs by Southern artists and thus, as they say in Charlottesville, to "showcase the diversity of talent in contemporary Southern photography." The show is up through June 5th, 2011. Included in the show is Emmet Gowin's Family, Danville, Virginia (1971), above. 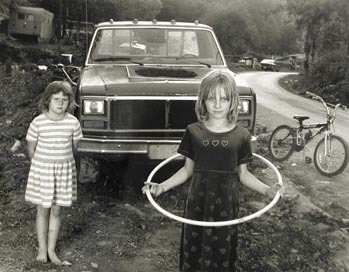 The show puts together work by Old Master Photographers William Christenberry and Emmet Gowin with mid-career photographers Shelby Lee Adams and Sally Mann and emerging photographers Jeff Whetstone and Pamela Pecchio. One way to put the vision of the show might be to say its an effort by its curator, William Wylie, of UVa's Studio Art Department, to come to terms with what he's gotten himself into by moving to the South. The show's all-too-brief and sadly image-free online catalogue says of the show that while the "South evokes different images for different people," "The New South is a complicated, culturally varied, and determined place" that "yields images in which the reality lies painfully close to the surface," and that the work in the show demonstrates that "each artist has filtered his or her responses to the region through highly individual sensibilities." Lest we despair over the show based on that remarkable collection of cliches, we know the work of these folks and have been following their careers for some time. We know that this show is definitely worth a visit, if for no other reason than to see more of these folks' work, and to see it together, three generations of Southern photographers' efforts to make sense of their places of origin, their regional and personal histories, their practices and identities as artists. The photographer least known to me is for that reason perhaps the most interesting on this occasion. Shelby Lee Adams, one learns from looking at his images and from reading his biographical sketch, has a complex and tangled history with this land and its people. Born in rural Kentucky, he went to the Cleveland Institute of Art and tried to do the American thing of reinventing himself, of claiming to be not from Kentucky but from Ohio. Yet Adams was drawn home to look and look again at his land and his people, the hardscrabble South, the land we lowlanders who now live on the Interstates know most from the work of Walker Evans and Marion Post Walcott who found it next door to us, or just down the road from where we live now, but 75 years ago. Adams occupies that strange and uncomfortable land of the artist who is successful as an artist who shows work at the Catherine Edelman Gallery and therefore sells to the urban glitterati of Chicago and NYC and who therefore is called upon to reveal and to disclose, and thus stand apart from his subjects, and also has to say this is where I live, so while you look, please honor and respect the dignity of these, my subjects, my people. 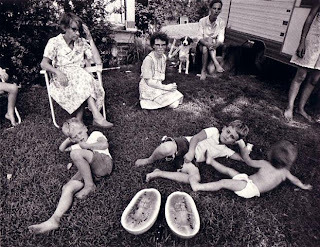 Being Southern is a lot about being family, and Southerners who look at Adams' images have to say, if they are honest, yes, these are my people, my cousins, my neighbors, my family. The UVa Art Museum show has provoked a vigorous response from Grace Elizabeth Hale, of UVa's Department of History, who reviews the show in an all-too-brief essay entitled Wounds, Vines, Scratches, and Names: Signs of Return in Southern Photography for Emory's splendid on-line journal of Southern culture Southern Spaces. Hale suggests that the catalogue's claim that Southerner photographers have a “distinctive sense of place" is a "seemingly dead idea." I'm sure she and Prof Wylie have interesting conversations over coffee after faculty meetings. Nevertheless, she finds the show "magical," a "visually and emotionally rich exhibit," in which these photographers' “southernness” lies . . . in their process and practice of return and the way their works layer space and time to evoke loss." Hale has some really insightful things to say about these photographers which is all on the Southern Spaces website so I won't repeat it here, except to make a small comment on her views of photography, which is for her primarily about loss. I could not agree with her more that the work of photographers is about "their process and practice of return." These photographers, like Christenberry, make an asethetic practice of return, to the same places, to the same people, to the same questions about time and place and history. But she goes on to say of these photographers that their works "layer space and time to evoke loss." "All photographs," she says, "play with time. They highlight its flow, capturing a present that passes even as the shutter closes. They evoke loss." But what for Hale ameliorates this melancholy work is the capacity of photography also to preserve a "former present . . . [so it] can return again and again. Because the photograph does not let its piece of the past go, it also soothes and assuages loss." Hence, the "photographers assembled here share a practice of layering, reworking, and revisiting people and places that foregrounds photography’s jumbling of time. In very different ways, they hold the place or person—the subject—steady so time can float free." Southerners who talk a lot about loss make me want to check the EXIT signs; we're getting awfully close to moonlight and magnolias here. When I see a series of Christenberry's images of the same place, yet different because they were taken at different times, I'm aware of loss but I'm not floating free of time. I'm in my time of looking, in the midst of my awareness of time, and time's changes, and of the one-way direction of time, and of our common journey toward that undiscovered country from which none return to tell the tale. I see change, and some of the change may well be for the bad but some of it is for the good, and its living in the legacy of the past but also with the necessity of time and change that helps make us Southerners. Photography, surely, is about change and the making of meaning out of past and present and our experience of it, not just about the aestheticizing of the lost, which I take it is what one does when one contemplates images from a freely floating perspective. I don't pretend that a photograph captures the past; a photograph is the result of a process of making that uses objects as the occasion for its performance. It is a record of the interaction between aesthetic vision, technique, materials, and subject, often with a good shot of serendipity thrown in. Southern artists are about making what they can of what they have; that's why art in the South seems to work best when it is close to craft, why one of the major centers of arts education in the South is the Penland School of Crafts. More of that anon; my thanks to Wylie for this show, and to Hale for her take on it, and for the folks at Southern Spaces for sending me a notice of it. Its Spring Break and this show may well be worth a road trip to Charlottesville. Bad timing -- it will be down before its time for Look3: Festival of the Photograph (June 9-11, 2011). What were they thinking? Either way, being in Charlottesville makes possible a visit to Tavola, which is the best Italian restaurant I've eaten in since last year in Bologna.